Information for parents and teachers to help recognise the symptoms of concussion and understand the best process for treatment and ongoing management of concussion. "Brains are too important for the rest of their lives to be messing with." Concussion is a brain injury caused by a knock to the head or anywhere on the body, where the force is transmitted to the head. It can also be caused by a fall. Concussion involves temporary neurological impairment. The symptoms may evolve over the hours or days following the injury. While all concussions should be assessed by a doctor, most will resolve without the need for specific treatment. Rest, followed by gradual return to activity is the main treatment. Recognising concussion can be difficult. It is important to know when to suspect concussion, because appropriate response and management can help prevent further injury or even death. There are several possible symptoms and signs, but they can be subtle and they are not specific only to concussion. Onlookers should suspect concussion when an injury results in a knock to the head or body that transmits a force to the head. A hard knock is not required—concussion can occur from relatively minor knocks. Use the Concussion Recognition Tool 5 to help you recognise concussion. have difficulty concentrating and answering specific questions. Loss of consciousness, seizure or balance difficulties are clear signs that an athlete has sustained a significant injury. Urgent medical support is critical in these circumstances. In some instances, it will be obvious that there has been a significant injury where the athlete loses consciousness, has a seizure or has significant balance difficulties. Parents and teachers need to be alert for evidence that an athlete is behaving unusually or out of character, exhibits signs of disorientation, clumsiness or loss of balance. If an athlete displays these symptoms/signs they may have a more serious injury. They should be immediately taken to the nearest emergency department. First-aid principles apply. Neck injuries should be suspected if there is any loss of consciousness, neck pain or a mechanism that could lead to spinal injury. Athletes in this type of situation shouldn’t be moved without guidance from appropriately trained individuals. When: what time did the injury take place? How: how did the injury occur? For example, is the injury from a knock to the head by a cricket bat or by an opponent’s shoulder? Where: where on the body was hit? For example, the temple, shoulder or back of head. What: what occurred next? Including symptoms such as loss of consciousness, convulsions, amnesia, vomiting or confusion. Additional useful information: any further symptoms such as behavioural changes or loss of memory. If in doubt, sit them out! If there is any doubt about whether an athlete is concussed, that athlete should not be allowed to return to sport until cleared by a medical practitioner. The diagnosis of concussion should be made by a medical practitioner. They will take a clinical history and conduct an examination taking into account how the athlete was injured, symptoms and signs, cognitive functioning and neurological assessment including balance testing. check their medications with their doctor. If diagnosed with concussion, athletes require immediate physical and mental rest; this allows the brain to recover. To properly rest, time off school or work may be needed. Mental rest may include refraining from playing computer games, reading and watching television. 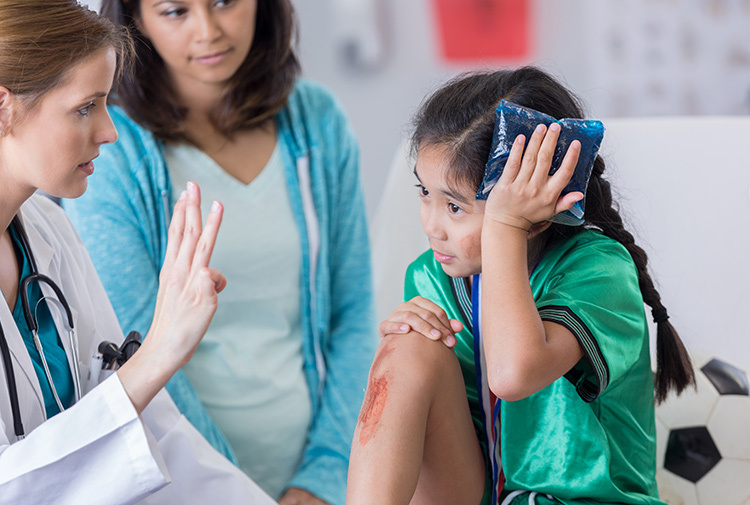 Children and adolescents aged 18 years or younger take longer to recover so a more conservative approach to concussion management should be taken. Concussive symptoms usually resolve in less than four weeks. The child should not return to contact or collision activities less than 14 days after all symptoms are cleared. ‘Return to learn’ is about the athlete’s gradual return to their usual program at school or work. 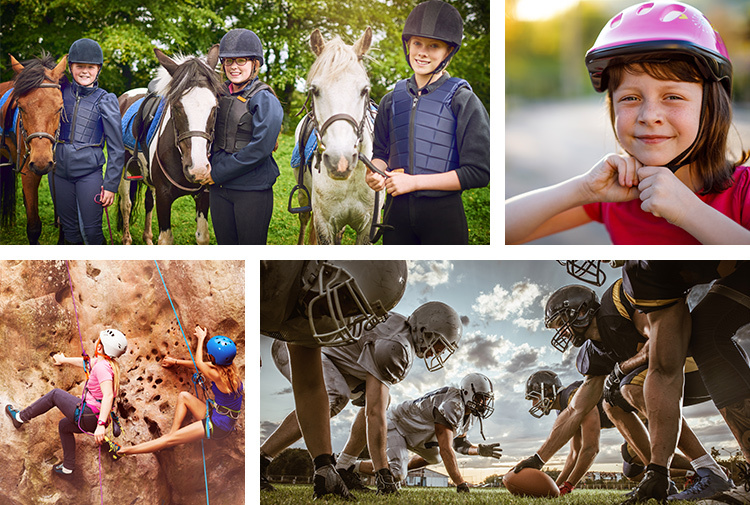 Having rested for 24 - 48 hours after sustaining a concussion, school-age athletes can return to school or study - as long as these activities don’t worsen symptoms. Thinking or concentrating for long periods can bring on or worsen symptoms of concussion. Gradually increasing the load on the brain without provoking symptoms is recommended. School programs may need to be modified to include more regular breaks, rests and increased time to complete tasks. Exams during that period may need to be postponed. Return to school and learning should take priority before returning to sport. A concussed child should not return to sport until they have successfully returned to normal school activities. 'Return to sport' is about the athlete’s gradual return to full sporting activity. Having rested for 24 – 48 hours after sustaining a concussion, the athlete can begin light physical activity - as long as the activity doesn’t worsen symptoms. Once symptoms have cleared, the athlete can begin a staged return to sport. Athletes should only progress to the next level when they have completed 24 hours at the current level without recurrence of symptoms. If symptoms recur or worsen, athletes should step down to the previous level and complete at least 24 hours symptom free at that level.. These Return to Sport protocols can be used to inform Return to Sport programs. 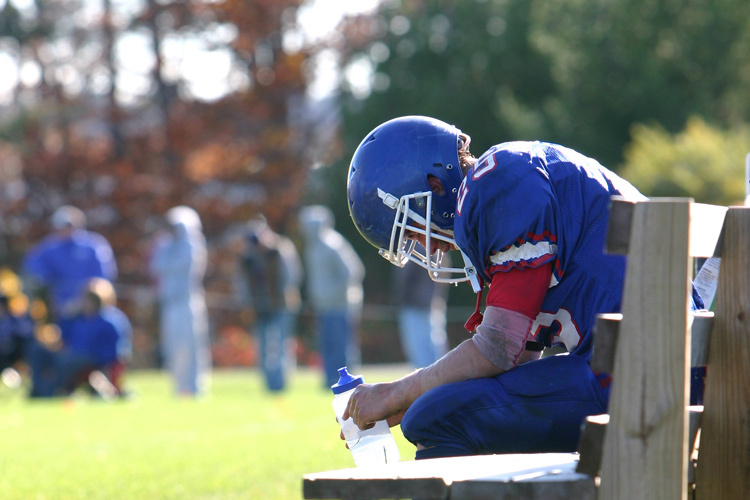 There is a potential link between mental illness and concussion. Athletes with a history of mental illness should discuss this with a doctor. Where there is a history of mental illness, a more cautious assessment and a more conservative management approach should be taken. Lifeline provides a 24 hour, 365 days per year crisis support and suicide prevention service. It is free and provides immediate support for those in need. Headspace is a national youth mental health support service providing mental health assistance to those aged 12–25. Beyond Blue supports Australians to protect their mental health through education and awareness. There has been recent concern about potential long-term consequences of concussion. Chronic traumatic encephalopathy (CTE) is a type of degenerative neurological disease that may be associated with a history of previous concussions. There is no reliable evidence clearly linking sport-related concussion with CTE. Adopt a conservative approach to return to sport. Helmets will not stop concussion from occurring. Evidence suggests that helmets, mouth guards or other protective devices offer little if any benefit in the prevention of concussion. These devices are important, however, for the prevention of other traumatic head injuries such as lacerations or skull fractures. Sporting organisations need to continually review their policies for best practice concussion diagnosis and management. 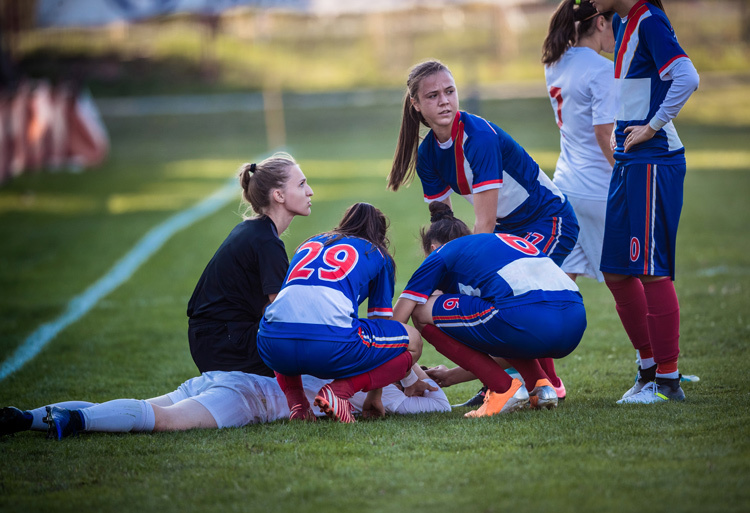 High-risk sports, such as professional collision sports, need to ensure that medical personnel are appropriately trained in the detection and management of concussion. Proposed rule changes require careful consideration of the potential benefits versus possible unintended negative consequences. Sporting organisations in Australia have responded to the increased concern regarding concussion. The four major football codes have introduced rule changes in recent years to ensure more thorough clinical assessment of the athlete with suspected concussion and to enforce guidelines around management of the concussed athlete. The increasing awareness of sport-related concussion and the associated community concern mean many sporting organisations have developed their own guidelines for the management of the condition. These guidelines are constantly evolving through ongoing review. There is a strong alignment across the various sporting codes, supported by the latest scientific evidence on concussion diagnosis and management. Parents and teachers need to have a good understanding of concussion in order to appreciate the importance of identifying symptoms and supporting athletes during recovery and as they return to sport. Parents and teachers must be able to recognise the symptoms and signs of concussion in order to detect concussion when no medical supervision is present.